03 Dec Women in International Law: A Vanishing Act? The recent nominations for judicial posts at the UN International Residual Mechanism for Criminal Tribunals (IRMCT) have caused outrage. However, the frustration expressed regarding the lack of adequate representation of women on the international stage is not new. The issue is not just one of gender representation but also crucially of access to justice. This is therefore an opportune time to take stock of the gender (im)balance in the international legal sphere. For the election of judges at the IRMCT, the UN General Assembly received the nominations of eleven men for two positions. The residual mechanism already consists of only five women out of twenty-two judges. The fallout from this has been substantial – with calls to reopen the nomination process by organizations campaigning for gender parity denouncing the process, as well as the Association of Defence Counsel. Whether the nomination process will be revisited is yet to be seen. So how do other international tribunals fare? The statistics are fairly stark. The situation of the United Nations treaty bodies is marginally better. 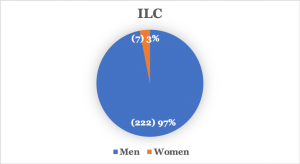 Using OHCHR statistics as of January 2018, there were 75 women of 172 members on the treaty bodies, bringing the percentage to 44% female representation. Of the ten committees, the only one with a high representation of women – at 96% – is the Committee on the Elimination of Discrimination against Women (CEDAW). The Committee on the Elimination of Racial Discrimination (CERD), the Human Rights Committee (HRCmt), the Committee against Torture (CAT) and the Subcommittee on Prevention of Torture (SubPT) have representation ranging between 40 – 50%, with the Committee on the Rights of the Child (CRC) split equally. Drilling down further into the work of the mandate holders at the UN, the picture is also not very rosy (OHCHR statistics as of December 2017, updated as indicated). Of the six current working groups, the working group on the issue of discrimination against women in law and in practice has all five women members. 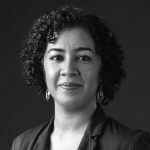 However, of the other five working groups, three groups have two women each (arbitrary detention, on mercenaries and updated in September 2018 for African descent), and two groups have one female member (human rights and transnational corporations, and enforced disappearances). Of the forty-two Special Rapporteurs (including thematic and country mandates), twenty are women and twenty-two are men. Of the eight independent experts, three are women. There are a few points to unpack, underlying the numbers. Firstly, the fact is that these positions are filled via nominations and then elections – ultimately, it is in the hands of states to put up candidates for election, and this is often where the roadblocks are. Subsequently, there is the question of election – at which point biases may again play out. But arguably, if the number of qualified female candidates increases, it would (hopefully) result in greater numbers actually being elected. Another aspect that needs greater inquiry is the status of women in the legal profession. While not all of the appointments mentioned are based on legal expertise, the judicial appointments clearly are, as well as some of the treaty bodies and mandate holders. In this case, the status of women in the practice of law across jurisdictions is relevant – and needs further analysis. Relating to the judiciary specifically (as most judicial appointments require that the candidate be capable of being appointed a judge), statistics in many jurisdictions are weak. 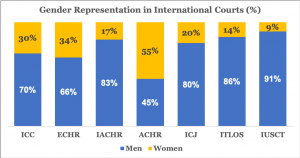 Upon a cursory review of a few countries, approximate percentages of women in the judiciary are: 30% in the U.K.; 36% in federal courts in the U.S; 28% in the lower judiciary, and 12% in the higher judiciary in India; 35.9% in Brazil; and 28% in Singapore. While clearly more countries need to be assessed, the low numbers here lead to questions related to the intake into the legal system more generally, and ultimately legal education and law school enrollment – which by many accounts has an increasing number of female entrants. So where do all the women go along the way, resulting in their absence ultimately at tables where agendas are set, and in courts where significant decisions are made? The overall picture is not encouraging. There are some gains that have been made, mostly in the last two decades. But there is a long way to go still. The statistics are stark, and really require a doubling down on efforts to level the playing field. This post may be perceived as self-serving for women like me in this field, or encouraging of victimhood. On the contrary, this is an effort to highlight that important questions of representation and lived experience are in fact borne out by the statistics, and that women’s voices and abilities are ignored all too often. It is also more fundamental than representation – it is a matter of access to justice, not just in regard to legal remedies but in the approach towards the law, and what is visible in the eyes of the law. And for this, half of the world’s population deserves a say.